There has been a gaggle of baby knitting going on over here - a very important little person is coming into the world and I've made it my personal mission to instill a high wool tolerance, nay, dependence on the little one. Also - baby stuff can make anyone feel like a super knitter - little projects that give you the similar types of construction satisfaction (sometimes) as larger garments, take about a tenth of the time, and give you an excuse to play with all those beautiful yarns you were saving for something special but didn't have enough of to make anything substantial with. Works for me! Now, Cisco. Here's a project that is almost too cute for it's own good. You know, the project that makes you giggle as you work because it's so darned cute... and because you know that any little head when wrapped in little ears like this will be ten times more likely to induce cute-baby-sighs. The original pattern is written for various brightly colored yarns, striped together. I opted for a more subtle self-striping look. As I always say, when the yarn can do the work for you - just let it. And when you have the chance to put a little handspun to good use (with garter stitch) - do it. There are some fun and clever little construction details on this - like the formation of the ears, mitered forehead point, and shaped back-of-head portion. All pieces are knit flat, but picked up and worked directly off of one another, so no seaming is involved (brownie points). Aside from the difference in yarn choices, I only made a few small modifications to the existing pattern. I omitted the stockinette center peak of the forehead - I liked the look better keeping it in garter, and rather than using YO increased, I worked raised bar increases to omit holes. I trimmed the whole thing in a solid contrasting color - one ridge of garter stitch with a bind off in purl from the RS. I left 3 live stitches at the base of each earflap as I was binding off and made them into I-cord. I made the I-cord just long enough to tie, but not so long as to be a dangling nuisance for parent or child. What a little gem of a pattern this is - highly recommended and definitely worthy of getting of the regular-baby-knits list if you ask me! Thanks to the lovely ladies of the Berocco DT for another winner! tres, tres cute. I love your blog and your creations. It's a lovely work of art. It reminds me of a horned owl. Bravo- beautiful as usual! So, darn, cute! I'll be making many, many of these :) Thanks Jared! So, so awesome. But it's the beautiful buttery-beigey handspun that makes it so Fuzzy Baby Animal perfect. and yours look real nice! REALLY, REALLY cute! So would this be for a little tweed-baby? Love it! Can't wait for the next of my friends to make an announcement just so I can make one! That is adorable! I tend to shy away from cases of matchy-matchy (it tends to be a bit too much of the cutesy for me), but I really do love it when the pieces are different enough, yet made of the same materials, just like these are. That's wonderful! wow, absolutely adorable! i hope you'll get a chance to get some modeled shots - i love your pictures! That is so sweet and precious! What a sweet knit. I'll have to whip one up before baby number 3 arrives. This is so cute, as always... How about you try to knit something ugly? I'm just kidding (don't worry). It's just that you have such good taste... Congratulations again!!! I'm thrilled whenever I come here!!! Oh my goodness, are you going to be an uncle?!? Ah, the knitting opportunities that will come your way... so jealous! The hat is adorable, especially the outlined ears. i like what you've done here. the little ears on this usually look like little devil horns, which kind of puts me off making this for babies. Painfully adorable spawn head covering, and the perfect labor room project for my best friend's April delivery! Oooh, cute! Good call, omitting the stockinette spine-thingy. 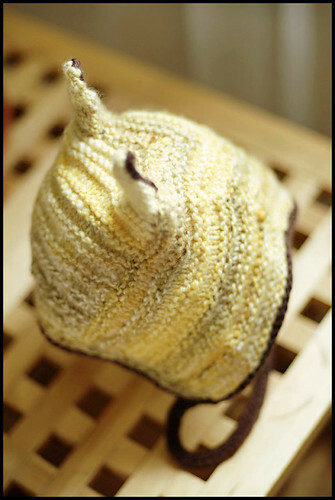 This hat will look amazing on a darling little one! Thank you for sharing it. So very very cute! I love your hand spun yarns they always look so wonderfully tactile makes me wish I could reach out and feel them. oh my goodness. This hat, and you and your writing, are TOO CUTE. That is too cute for words. What a lucky baby and what lucky parents to have someone knit such lovely things for the new arrival. Toys. My youngest has great wool tolerance because I made his toys out of wool. He loved them so much they're partly felted, but he loves the smell and feel of them and chews them slightly less than store-lovies. Watch out, though! Amigurumi is completely addictive! Your knitting are fantastic and so are your photos! What a great case of subtle matchy matchy - aw. Lucky baby-mama combo. 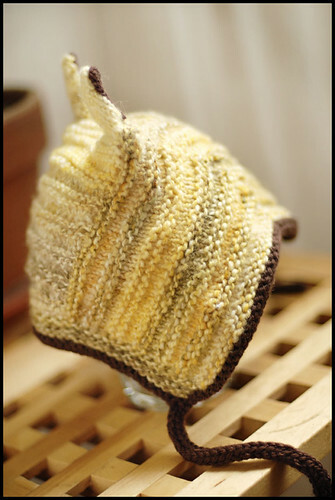 The hat is simply precious and a lovely use of handspun! That is a super cute hat! Much more interesting than anything I've gotten to make for babies lately. Dont know what to say about them ears on top but truly a cute gimmick suitable for a precious new being. Be proud! This is super cute! The golds and the browns reminded me of Winnie the Pooh. (The watercolor illustrations' coloring, not the Disney coloring!) Perfect for baby! Wait, did I go to Cute Overload by mistake? I am now distraught that all my niblings (shorthand for nieces and nephews) are far too old for cute baby clothes. It almost makes me wish I had a baby to knit for. And your photos as always are totally inspiring. Totally adorable hat! Congratulations to all! Oh...I really love this little hat! i was just going to say this reminds me of a horned owl, but i see someone beat me to it! so stinkin' chic! So gorgeous! I have a little grandchild due in 2 weeks whose parents would love one of those! A general rule of thumb is a hat for a preemie should fit on on an average orange, and a hat for a newborn should fit on a grapefruit. Babies' heads grow fast, and by age 2 are often almost as large as adults. (My son's head at 2 was 1 inch smaller than my adult female medium). His head has not grown at all since he was 2. Love your version of this hat. I for one can never envision a pattern other than what it is! Thanks for helping me to "see" outside the box! It is gorgeous! Just found out that my choir director is now a grandmother. Cisco gets added to my Ravelry queue. Sending best wishes for the safe and speedy arrival of the special new person. Love the hat too. It makes me think of the 70's Rock'n Roll Wolf musical with the little kids dressed up as goats and lambs. Love that show! It's adorable, and congratulations on the upcoming important little person. How exciting! just found your blog and it's fantastic! i'm in the southern hemisphere so we're heading into the colder months. i think i may have to start knitting again. Very beautiful. I only ever get time for baby knitting nowadays. 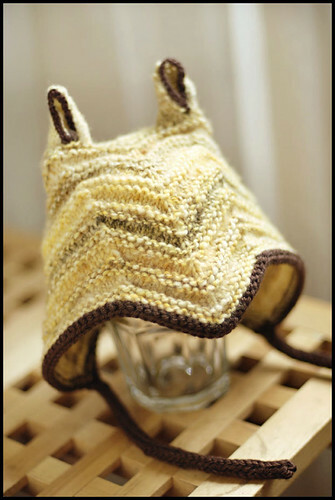 I actually have a really old pattern quite similar to this one but it has a single cone coming out of the back instead of ears. A bit like a jesters hat. The cutest thing ever! Almost makes me want to have babies. Just so I can knit stuff like that. I'll just have to find someone to give it to. I can't NOT knit it. Its too adorable. Now that's just darn cute! Gosh, I sure missed your blog; it's overflowing with fabness! I'm suddenly finding myself surrounded by newborns now. What's going on? I'm going through a baby knitting phase that's really enjoyable, though. I nice change from adult sweaters. Amazingly gorgeous. 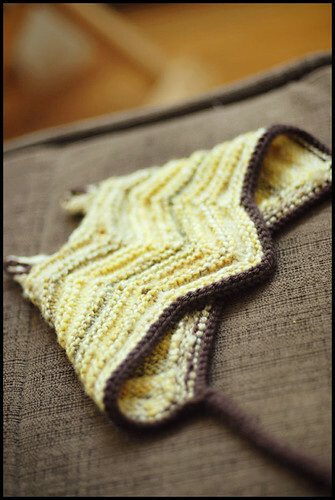 I am sure a couple of knitters I know can use this pattern as they are knitting for babies. I love that hat. What a lucky baby, and mama, too. Hi, i love your Hemlock Ring Blanket. Is it OK if i translate it into finnish for my mum, and then mayde publish in my blog if there are other finns who would like to do it? What a cute hat! Think I'll have to add that to my "To Do" knit list! Would love to be a baby again, so I could wear this adorable hat! Cute. I have visions of knitted Batman outfits ahead of you, knitted lamb outfits - your talents will be in high demand beyond the baby years (I'm now a mother of teenagers, wistful for the days when they appreciated the things I lovingly made for them - nowadays only knitted socks are willingly accepted). I love this hat! I wish I had a baby to knit it for (like a neighbor, or niece or something). This pattern is great! That hat is so cute, I think I might want to make a larger version for me. this is the cutest thing ever. if i knew some babies, i would prob partake in baby knitting. Lovely blog hanwork, greeting from Belgium. i like your blog. thanx for inspiration.